I have a 30ft monster on my allotment and I planted the seed! 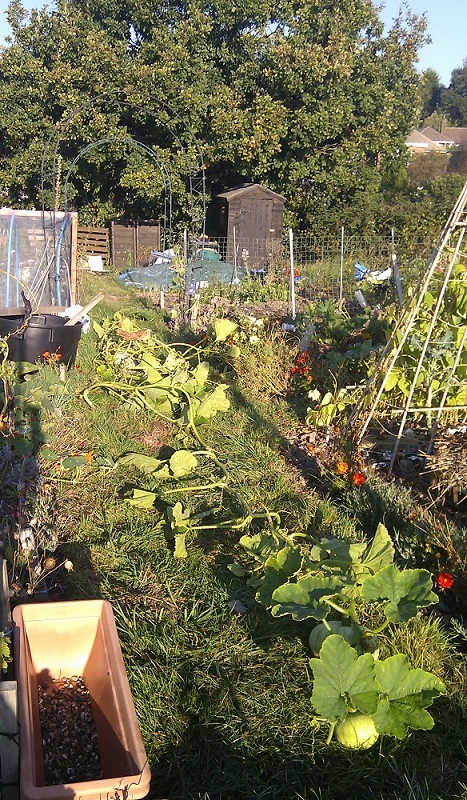 This week I’ve been picking, cleaning and storing the winter squash. It’s that time of year when I find out for certain what has grown well and what hasn’t. For pure fun and to placate my inquisitiveness I unravelled this monster, a Crown Prince winter squash, and laid it out along the main path. It had twisted and turned around itself, and it had produced 3 winter squash. Happiness! I need to store these beauties for eating over winter. I wonder what I’ll make with them? Cakes, curries, risotto, pasta, you name it! Previous Post Previous post: Food ~ what does it say about us? Thanks! It came as a bit of a surpirse to me too! I’ve read about squash vines taking over, but never expereinced it myself until this year.